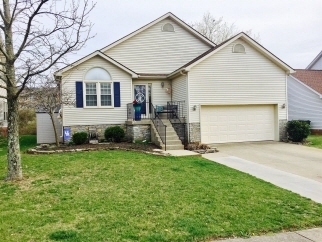 Description: Move-in-ready ranch on a finished walk-out basement with attached 2 car garage. The front bedroom has vaulted ceilings, walk-in closet, and door leading into a full bath. Vaulted ceilings in living room opens to the eat-in kitchen. There is a deck off the kitchen covered by a sunsetter awning to complete a great space to bbq or relax. Large master suite featuring recessed ceiling with walk-in closet and garden tub in the bathroom. The basement includes a mother-in-law suite which provides great privacy for guests along with a family room. An additional room in the basement can be used for a 4th bedroom or office space. Very large walk-in storage room in basement with built in shelving. Large laundry in basement as well. All that and the basement walks out to an amazing large green space behind the house which backs up to a creek and turns your backyard into a small park. Data believed correct but not guaranteed. Buyer to verify data prior to offer. Agents read agent remarks.